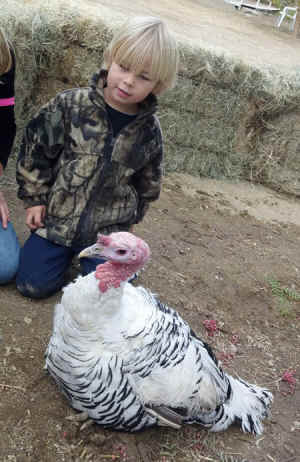 Jonah with a turkey friend at Gentle Barn, November 2012. Photo by Ronnie Steinau. To understand the complex suffering of turkeys raised for “food,” it helps to know that in nature, young turkey siblings stay close to their mother for four or five months after they are born. She is the center of their universe. Although turkeys raised commercially never see their mothers, the expectation of her is alive in their genes. In nature, when the maternal family is on a stroll, if one of her poults starts peeping distress, the mother bird clucks reassuringly and, if the peeping persists, she rushes to comfort her little one. When her youngsters grow cold and tired, they tell her so, and she crouches to warm and comfort them under her great, enveloping wings. If when the family are traveling together through the woods and fields, a little one strays, intent on his own pursuit, upon discovering that he (or she) is alone, the poult straightens up, looks keenly about, listens intently, and calls out anxiously to his mother. This is known as a “lost call” – the call of a frightened young turkey, perceiving that he is alone, for his mother. When she answers his searching cry, he calls back to her in relief, opens up his wings, flaps them joyfully once or twice, and runs to rejoin his family. In nature, baby turkeys start talking to their mother hen while they are still inside the egg, all nestled with their brothers and sisters in the deep warmth of her feathers and knowing her and her voice long before they hatch. Whenever I think of baby turkeys in the mechanical incubators, hatchery mutilation rooms, filthy sheds, terrifying trucks, and slaughterhouses, I imagine the lost calls of all the turkeys in the world that will never be answered. For them there will never be a joyous flapping of wings or a vibrant turkey family reunited and on the move. Turkeys rise into our consciousness at Thanksgiving, and then they are almost completely forgotten until the next year comes around, yet turkeys are being slaughtered every day – many more than for Thanksgiving. For them, every day is “Thanksgiving,” an endless harvest of horror. Let us not forget them. Let us remember all the turkeys and advocate for them and their liberation in January and July, as we do in November. For delicious holiday and everyday recipes visit UPC's recipe section. UPC correspondent Ronnie Steinau and friend Jonah leaflet for turkeys in San Diego, November 2012. "He's four and has been vegan since birth. He is an ardent activist and passes out lots of leaflets for turkeys and chickens."